John Ralston Saul is a Canadian writer and Canada’s leading public intellectual. He is a prolific writer and has published some 22 books, both fiction and nonfiction. In 2009 Saul was elected president of PEN International. His career took off earlier, in 1992, when he published Voltaire’s Bastards: The Dictatorship of Reason in the West. It caused quite a stir, instantly elevating Saul to celebrity status. 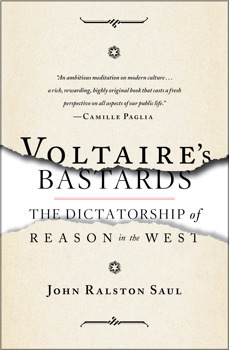 All these problems, John Ralston Saul argues, are largely the result of our blind faith in the value of reason. Over the past 400 years, our ‘rational elites’ have turned the modern West into a vast, incomprehensible, directionless machine, run by process-minded experts—’Voltaire’s bastards’—whose cult of scientific management is empty of both sense and morality. Whether in politics, art, business, the military, entertain­ment, science, finance, academia or journalism, these experts share the same outlook and methods. The result, Saul maintains, is a civilization of immense technological power whose ordinary citizens are increasingly excluded from the decision-making process. In 2005 Saul published another surprising study: The Collapse of Globalism and the Reinvention of the World, in which he warned that globalism was not working. 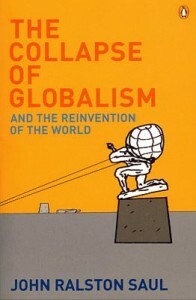 The Collapse of Globalism was re-issued in 2009 with an updated epilogue that addresses the 2008 economic crisis. 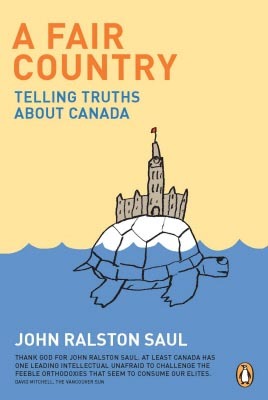 Then, in 2008, he published In a Fair Country: Telling Truths about Canada. In this startlingly original vision of Canada, thinker John Ralston Saul unveils 3 founding myths. Saul argues that the famous ‘peace, order, and good government’ that supposedly defines Canada is a distortion of the country’s true nature. Every single document before the BNA Act, he points out, used the phrase ‘peace, welfare, and good government,’ demonstrating that the well-being of its citizenry was paramount. Canada is a Métis nation, heavily influenced and shaped by aboriginal ideas: egalitarianism, a proper balance between individual and group, and a penchant for negotiation over violence are all aboriginal values that Canada absorbed. obstacle to progress, Saul argues, is that Canada has an increasingly ineffective elite, a colonial non-intellectual business elite that doesn’t believe in Canada. It is critical that we recognize these aspects of the country in order to rethink its future. Now that Canada is preparing for an election, these issues are urgent. As a follow up to A Fair Country, Saul published The Comeback in 2014 in anticipation of Canada’s Truth and Reconciliation Report, which was published at the end of May 2015. WHEN IT COMES TO ABORIGINAL PEOPLES, SYMPATHY FROM OUTSIDERS IS THE NEW FORM OF RACISM. It allows many of us to feel good about discounting their importance and the richness of their civilizations. Sympathy is a way to deny our shared reality. Our shared responsibility. Sympathy obscures the central importance of rights. If not sympathy, then what? In September 2013, in the Columbia River Basin, I listened to Kathryn Teneese, chair of the Ktunaxa Nation Council, explain that the first step is “recognition and acknowledgment.” Then we can work at our relationship “one step at a time – and gradually – find things we can do together.” In other words, “reconciliation” is not an event. It is not an apology, although an apology was necessary. And it is certainly not something so lacking in respect and dignity as sympathy. In any case, no solid relationship is possible so long as the Canadian government continues to rise in courtrooms and begin cases against the rights of Aboriginal nations by first arguing before the law that they do not exist as a people. This is our government. What could sympathy possibly mean if it is preceded by a denial of existence…. On the prairies there is an important piece of formal rhetoric: a question and an answer widely used in public meetings in order to remind everyone present of the reality in which they live. That is, we living Canadians are the treaty people and the time has come to recognize our responsibilities and acknowledge our fellow Canadians with all due respect. hopes to guide and inspire Aboriginal peoples and Canadians in a process of reconciliation and renewed relationships that are based on mutual understanding and respect. Over six years the Truth and Reconciliation Commission (TRC) collected 6,740 statements from witnesses and recorded 1,355 hours of testimony. It all culminated in 94 recommendations presented in Ottawa … amidst four days of events and ceremonies attended by thousands. In its report, the TRC writes about the ongoing effects of colonialism, the ‘policies of cultural genocide and assimilation’ and the huge rift this has caused between aboriginal and non-aboriginal people. ‘But the process has already begun,’ the commission adds. 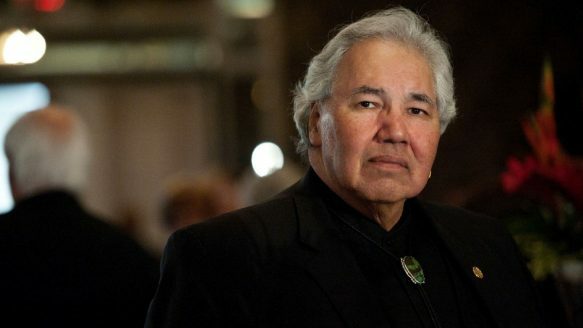 Murray Sinclair is an Ojibway-Canadian judge, First Nations lawyer, and was the chair of the Indian Residential Schools Truth and Reconciliation Commission. There’s a sense of relief about finally being able to talk about the report publicly, as well as a sense of achievement based upon the reaction to it at this point. But at the same time, we know there’s also a sense of the tremendous amount of the work that remains yet to be done. He pointed out that education is the perfect starting point for changes to be made. In The Comeback, Saul reports that an increasing number of Aboriginal people are now graduating with higher degrees. It is worth noting that the majority are lawyers. Not only is the Aboriginal population increasing, but it looks like First Nations peoples are learning how to defend their rights. In this video from democracynow, Dr. Pamela Palmater, a Mi’kmaq lawyer, professor, activist and politician from Mi’kma’ki, NB, asserts that the Canadian Government is guilty of genocide. Canadians must follow through on the recommendations of the Truth and Reconciliation Report. In June 2008, Prime Minister Stephen Harper offered the first formal apology to the First Nation’s people. While this was an important first step, upon publication of TRC Report, Harper would not commit to any of the 94 recommendations. This will not do. Our next prime minister must make these recommendations a serious part of his or her mandate. 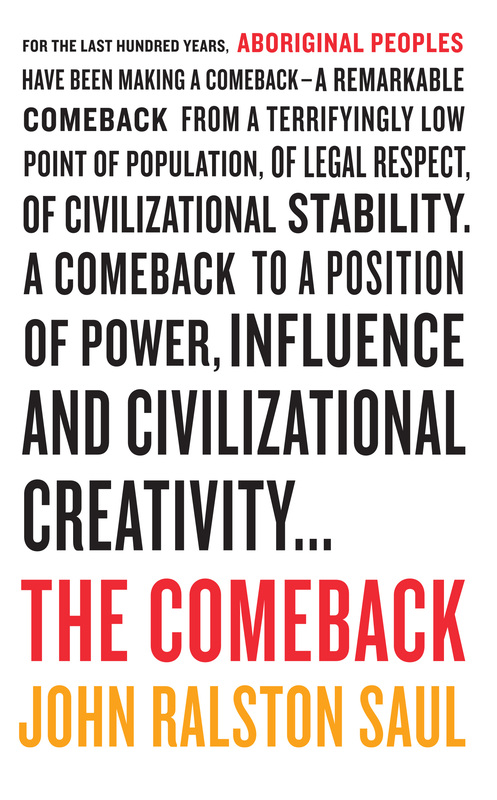 To better understand why, I strongly urge you to read Saul’s The Comeback.